Access to the park at Midge Creek is via water vessel. Water-oriented activities are most popular, with angling for kokanee, Dolly Varden and rainbow trout. Boasting more than a kilometre of sandy beach, it is a popular destination for boaters. 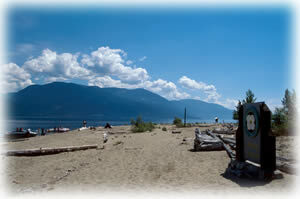 Midge Creek Park is located 38 km south of Balfour, on the southwest shore of Kootenay Lake across from Sanca Creek. History: This park was established on December 4 1987.